In early 2014, Facebook made waves in the tech world by acquiring WhatsApp for an astounding $19 Billion. Although WhatsApp had posted tremendous growth numbers, many wondered aloud if Facebook had lost its mind. Many had similarly balked at the $1 Billion acquisition of Instagram just a year-and-a-half earlier, but this most recent takeover made that seven figure grab look like chump change. What on earth was Facebook thinking? Well, in summer 2014 they gave us all a very big hint when they made their Messenger app a mandatory download for those who wanted to use their chat product on mobile. Suddenly the plan started to come into focus. Facebook had seen the writing on the wall and understood that more and more interactions were being diverted from Facebook’s public domain and being carried out in private. Facebook wanted to monetize all that attention and was leveraging the talent and know-how they acquired from WhatsApp to create a platform to do exactly that. What is worth noting though is that the explosion of mobile computing has led to one particularly important outcome for our discussion – chat apps have grown at an even faster pace than mobile. In 2014 (the year that mobile usage officially overtook desktop usage), the messaging apps user base has increased a staggering 100%. This is a bold claim, but the numbers really justify the hype. Mobile chat apps seem to be disproportionately benefiting from the rise of mobile, and this is certainly a great wave to be riding. As the number of mobile users rises, and the time spent on mobile increases, all of that attention is really not being capitalized on in the same way that more traditional social networks have monetized their users. The combination of out-of-control growth and the relative lack of monetization can only mean one thing. Messaging apps are about to become the next marketing boom-town. The time users are spending on messaging services has encouraged investors to value them highly, even though it is not yet clear how some of them will make money. . .
Far from being a downside, this is actually a good thing for advertisers. Increased investment in a field that has not yet figured out how to monetize its user base means the pressure to turn a profit will be on, and competition will be high for chat apps to figure out an ad model that works. Competition almost always benefits the customer, and in this case the customers are advertisers and brands. This is almost exactly the same thing that happened with traditional social networks (funny how we call them “traditional” even though they’re less than a decade old). Many competing networks all responded to a trend in user behavior and all sought to capitalize on the growing user base. Once a few platforms had begun to reach a critical mass of users, they then responded by developing specific technologies for monetizing these users and their information. The result was a windfall for those that cracked the code. Just look at Facebook’s “traditional” social networking business as an example. 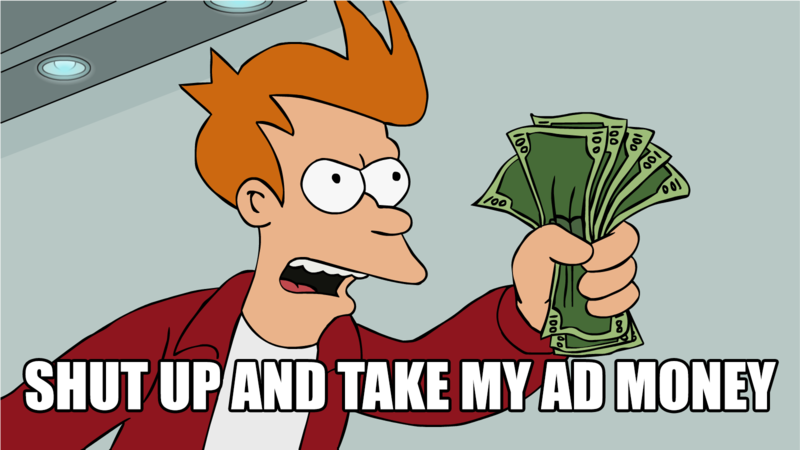 Now paying to promote a post is pretty much essential for any serious marketer. And, because of Facebook’s ubiquity, that means everyone is shelling out a pretty penny just to participate. 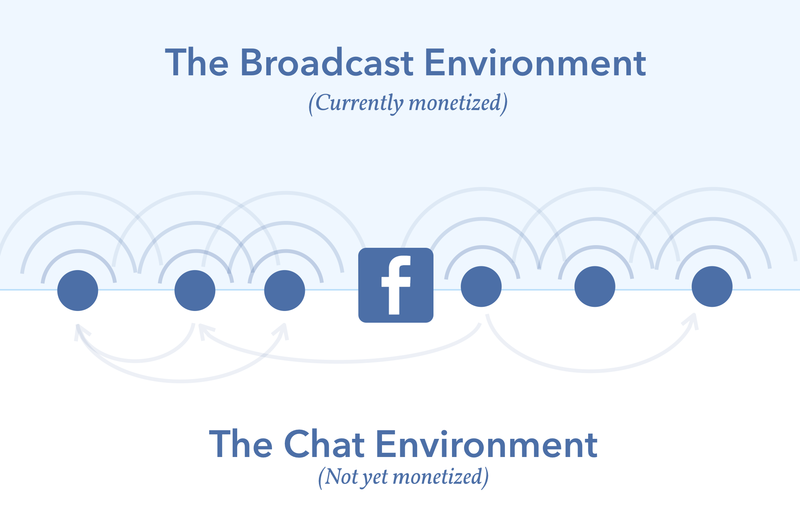 Another important thing to note is that instead of competing directly with “traditional” social networks, the chat ecosystem constitutes an entirely new space for marketers and technology providers to monetize. Evaluating chat apps as distinct from other types of social networks allows a much more realistic understanding of their potential. Consider Snapchat as an example. It was discounted from the beginning because it was being called “just another social app.” In truth, comparing size and functionality to a traditional social app, Snapchat was unimpressive. However, what critics didn’t see was that Snapchat was aiming to conquer a different category entirely. They were a completely new type of social network. Now they are able to bat away multi-billion-dollar bids because they are one of the first prospectors to hit upon a new vein of gold. Besides the alarming growth-rate of chat apps, there is something very compelling that these apps have going for them. There is simply so much richer context in a chat environment than there is in any type of digital communication. This is especially potent if contextual, real-time data can be linked back to a central profile (which Facebook certainly has the potential to do). Look no further than what Google did with their Gmail ad product. Many claimed that nobody would tolerate an advertising platform reading their emails and intruding on their communications, but once Google offered a good enough service and ensured that the ads were discreet, Gmail bloomed into a multi-billion dollar product. There is certainly room in chat for similar ads to Gmail. Discreet, contextual and hyper-relevant links to other apps, pages or pieces of content might become the new PPC of chat. In fact, the very popular Asian chat platform WeChat recently rolled out ads close to what I am describing, and early pilots show they have massive potential. Contextual relevance is definitely a strength of chat, but perhaps its most powerful asset is the reach and immediacy of chat as a platform. This combination of factors could very well make it the content distribution mechanism that brands have been dying for. It’s impossible to look at what Snapchat has done with their Discover feature and not see the massive promise this holds as a content distribution channel. 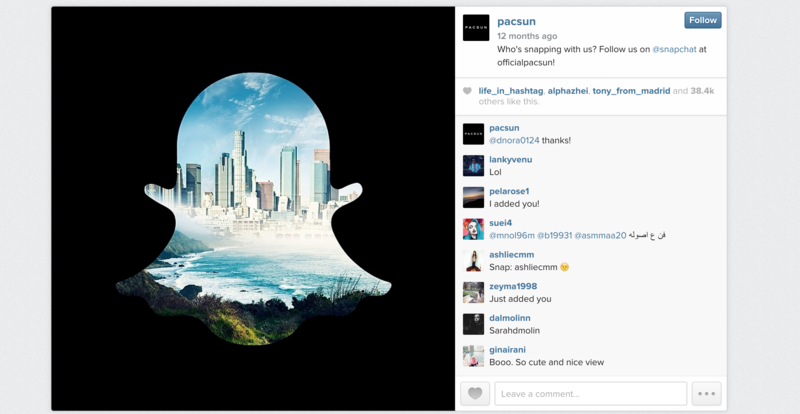 While it’s unclear just how effective Snapchat’s initial pilot has been, there are some clues. First of all, reportedly the rates they’re charging are astronomical. Despite this, brands seem to be lining up. 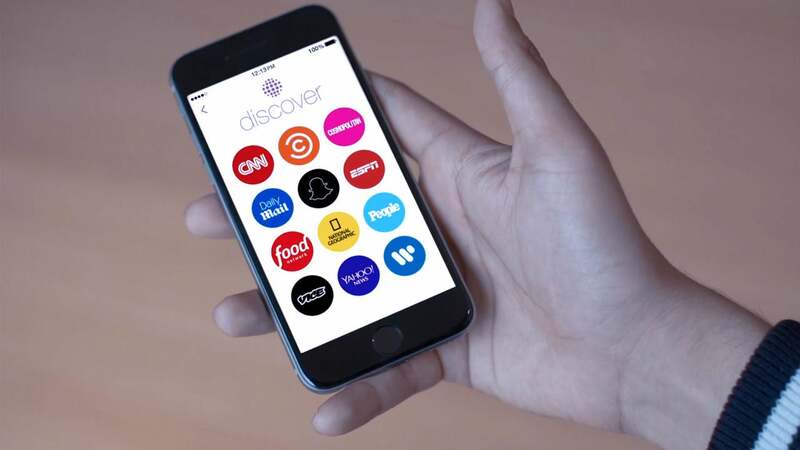 Another even clearer indication that this is the future of content distribution is a very recent deal with the small network Fusion (ABC/Univision) to release five different TV series exclusively on Snapchat Discover to the European market. Clearly this is a test Snapchat is running in it’s growing market before it brings similar offerings to its main U.S. audience. When this is finally a real possibility for any and all content publishers, it will be an absolute mad rush to get in on the action. As if confirming all of these suspicions, social marketing trend-setter BuzzFeed recently put its chips on the table and hired a full-time staffer just to manage their chat app presence. If that’s not a testament to the promise of chat apps as marketing tools, then I don’t know what is. While there is a lot of potential for chat apps to dominate the new marketing landscape, this opportunity must be handled gingerly. One of the very things that makes chat so appealing is the intimate one-to-one nature of the communication. But this asset can quickly become a liability if brands become intrusive. As I made very clear in my article on email marketing, when it comes to personal communication, getting permission from your users is absolutely crucial. The brands that succeed in the chat app marketing environment will be those that court their users on the platform (as well as on other platforms) and encourage their audience to invite them into their chat experience. Advertising on social is unlike old-school advertising because you can’t just turn on the budget and expect your ads to work. These paid forms of social advertising (in chat, just like on traditional social networks) will absolutely have to be supported by a strong focus on organic social results. While the future of chat apps will be propelled by new avenues for monetization and promotion, the brands that reap the real rewards will be those who already have a great organic presence. A perfect parallel are Facebook ads. They work fantastically for many brands, but those that did the best were the ones that had built a compelling Facebook presence before promotion was even an option. There can be a lot of speculation on how the future of chat app marketing will pan out, but the one thing that will prepare your brand for whatever opportunities lay ahead no matter what will be investing time and energy building an audience before you get trampled in the ensuing gold-rush.